3 guys in a bar: 1 for Trump. 1 for Clinton. 1 Undecided. One is a Donald Trump supporter. One is a Hillary Clinton supporter. And one thinks this election is "a lot like the movie 'Idiocracy.'" He detests both candidates. His plan? "Go with my gut on November 8th." From all the media hype, you'd expect these three men (who live in battleground state Ohio) to cuss each other out or start a WWE-worthy slugfest. Heck, Clinton and Trump didn't even shake hands before or after the final debate. But these guys in Ohio are buddies. 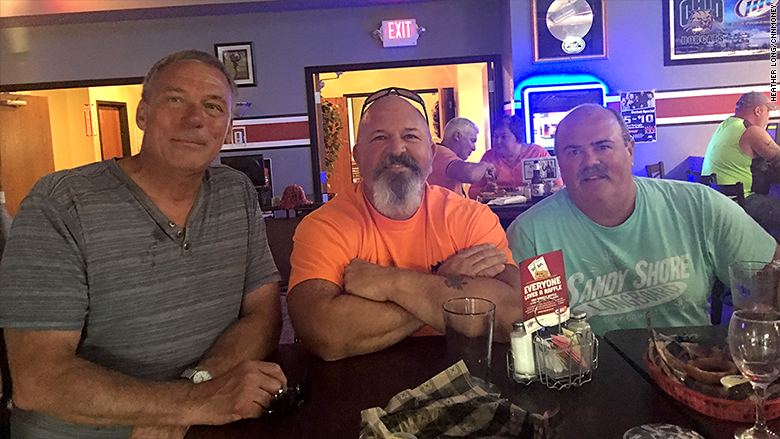 Randy Barr (Trump supporter), Bill Lutz (Clinton supporter) and Bruce Davis (undecided/disgusted) drink together almost every weekday. "What's so great about America [is]...we can all have differences of opinion," Davis says as his pals nod. "We can all say we vote for a Republican or Democrat or whoever and still be friends." Frankly, they wish the politicians in Washington would take a lesson from them. "In the politics today that we have, nobody is civil anymore. That's one of the reasons why nothing's being done," says Lutz, who prefers wine to beer. His pals rag him far more about that than his political views. Barr is mad about Obamacare. Davis is upset about factories closing in America and jobs going overseas. Lutz is angry that the "middle guy" pays a lot in taxes while many corporations get a free pass. But all three agree on this: U.S. senators and congressmen aren't doing their jobs, and it's hurting America. "We can all see this is a divided country," Lutz told CNNMoney in September. "It's almost like back in the 1860s." These three men typify middle America. They're white. They have good jobs at the same energy plant. They have families. They care deeply about Ohio State football. "We get a lot of work done and then we sit back and say, 'It was great.' That's the way it should be, and that's the way it should be in Washington," Davis says. All three also believe in the American Dream. Lutz says he's proof it exists. He grew up in a very poor family that was on welfare from time to time. Serving in the military made him more focused and ambitious. Now he's a chemical operator at a plant in southern Ohio. Bill Lutz (left) supports Clinton. Bruce Davis (center) is undecided. Randy Barr (right) supports Trump. They are still buddies who drink together. Lutz is an hourly worker. Davis and Barr are salary guys who manage transportation and waste at the plant. They disagree frequently at work over how to get various projects done, but they respect each other. They know they are each trying to do their job. "I just wish [Democrats and Republicans] would work together for the people," says Barr, who's voting for Trump because he thinks the solution is a someone "new, fresh" and "an outsider." Instead, they just see politicians fleeing back to their hometowns to raise money. When Lutz hears congressman say they have to go back and talk to their constituents, he just shakes his head. "Talk to your constituents through the TV. This isn't 1870. We aren't going by stagecoach anymore," he says. They may be voting differently this year, but over beers and wine, they think the same thing: Politics has "taken on a carnival atmosphere, and it's not really the carnival atmosphere that I think Americans want." They may be voting differently this year, but over beers and wine, they think the same thing: Politics has "taken on a carnival atmosphere," Davis says, "and it's not really the carnival atmosphere that I think Americans want." Editor's note: CNNMoney first interviewed these three friends in September at a bar in Waverly, Ohio. Bruce Davis was undecided at the time, but he has made up his mind to vote for Trump.